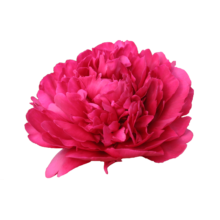 Opinions differ as to the color description of this brightly colored peony: this flower is not undoubtedly red. We think Paul M. Wild actually has a strong purple glow. What do you think? Although the opinions are divided, we think ‘red’ does not fully describe this special peony. The purple glow of Paul M. Wild makes the color of this peony much more diverse. Curious about this interesting color debat? Put this peony to the test and judge for yourself. Paul M Wild is the lesser-known rival of the peonies Kansas and Red Sarah Bernhardt. These peonies also have a purple-like color, big and booming flower buds and are double flowered. The advantage of this particular peony is its enjoyable fragrance. This flower blooms in the middle of the season.